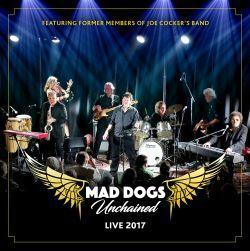 Mad Dogs Unchained - "Live 2017"
It’s a vision that has entertained and inspired whole generations – Joe Cocker’s musical legacy stays immortal and unmatched in the history of rock, soul and blues. Today, a unique project enables us to experience this great artist's work live on stage again. As members of Joe’s band, Cliff Goodwin, Mitch Chakour and Deric Dyer were part of a success story unrivalled to date. Under the name of Mad Dogs Unchained they now take the chance to revive the vitality of Joe’s music in the usual high-class performance. Although the irreplaceability of Joe Cocker’s voice is undisputable, the band found a singer in Elliott Tuffin whose heartfelt love and respect for his great idol shows in every second and octave of what he does. All this makes Mad Dogs Unchained an event for devoted fans from more than four decades and for a generation that never had the opportunity to experience this unforgotten concert feeling – for example with the whole family.